Disclosure: I bought this book myself and this is NOT a sponsored post. As always, my reviews are fair and unbiased. First Thoughts Everyone: the queen of YA is back! I seriously couldn't wait to have this book in my hands! After the Anna, Lola and Isla books ended, I was crushed and to this day, there still hasn't been a young adult book series that's made me feel the same way. So when I heard about There's Someone Inside Your House, I was dubious. But then the synopsis! Oh my goodness. It went on my TBR faster than I could breathe and when it got here, I had to painfully wait to read it until it was closer to Halloween time (you know, perfect Horror weather). In related news, WELCOME TO THE HALLOWEEN WEEK OF HORRORS DAY ONE! Review Young Adult Horrors have always been hit and miss for me. I either really love it or it's just not my kind of read (but the latter very rarely happens). Luckily for my own sanity and love of Stephanie Perkins' writing, this was one of the YA Horrors that I loved. Makani is completely different to those Stephanie's written before. She's got this secret that adds to her character in a complex, borderline mysterious way and I can already tell from the first few pages that it's going to be a darker novel than I'm used to from her, too. It doesn't take long for Makani to gel with new people after moving from Hawaii to a new small town and attending Osborne High, but she doesn't expect to be footsteps away from a killer with bloody motives. In between the heavy make-out sessions (she's the queen of romance in YA, what did you expect?! ), people are dropping dead in gory and blood-ridden ways. With every new death, Makani doesn't know what to do but try to stay alive now that the hunt is on to find out who the killer is and what their motive continues to be. But the closer that people get to finding out the truth, the more deaths that follow. And with every horror-filled night, comes another spree of deaths that keep the mystery going. I was totally expecting to be scared by There's Someone Inside Your House, but I wasn't. It wasn't that kind of scary, but more thrilling and nail-biting. But don't get me wrong, this isn't for the fainthearted. There's still a lot of blood and gore, and the deaths are slasher-movie worthy. This is still one of the best YA horrors I've read in a long time. It's not my favourite book that Stephanie has written (I'm looking at you, Isla! ), but it's deserving and a solid gold novel by one of my favourite authors. The writing was sharp and cut-throat mixed with snarky, it had a lot of diversity (just YES!) and Scream had better watch it's back! It's a total contender for being the next CW Horror show. Can you just imagine that kind of magic?! Sign me up! Overall, There's Someone Inside Your House rings true and cuts a four-star shape in the YA Horror genre. Stephanie Perkins at one of her best, and I'm so excited for every new thing she does! She can never go wrong. If your interested in winning a copy of THERE'S SOMEONE INSIDE YOUR HOUSE, look no further! Rating & Recs For fans of Stephanie's writing, YA Readers and Horror/Thriller fans! 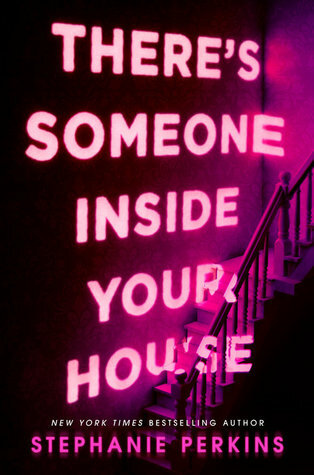 Have you read There's Someone Inside Your House?